DownWithTyranny! : Will Chris Christie Resign In Return For A Suspended Sentence That Keeps Him Out Of Prison? Will Chris Christie Resign In Return For A Suspended Sentence That Keeps Him Out Of Prison? 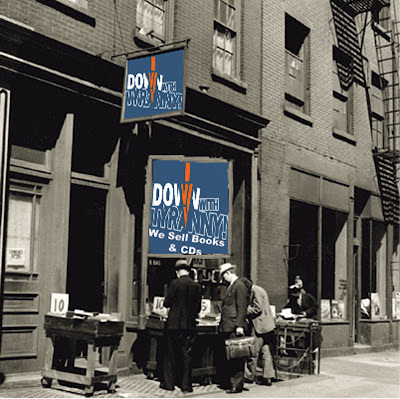 In October you'll be able to dig this post up and say, "Wow, those DWT folks sure knew what was up before anyone else." Fact of the matter, we've been predicting an eventual Chris Christie plea bargain since January when the Bridge-gate scandal started spiraling out of control. But over the weekend we got the word from an impeccable source that he'd be resigning as governor as part of a bargain to keep him out of prison and he'd do it before the first snow falls-- unless the first snow fall comes early. I was unable to ascertain what the smoking gun is, just that Christie won't be celebrating Christmas in Drumthwacket this year. Ostensibly, Christie is still the chief fundraiser for the Republican Governors Association and "a potential White House candidate." In 10 days, he'll be at the Iowa State Fair in Davenport raising money to reelect Davenport. 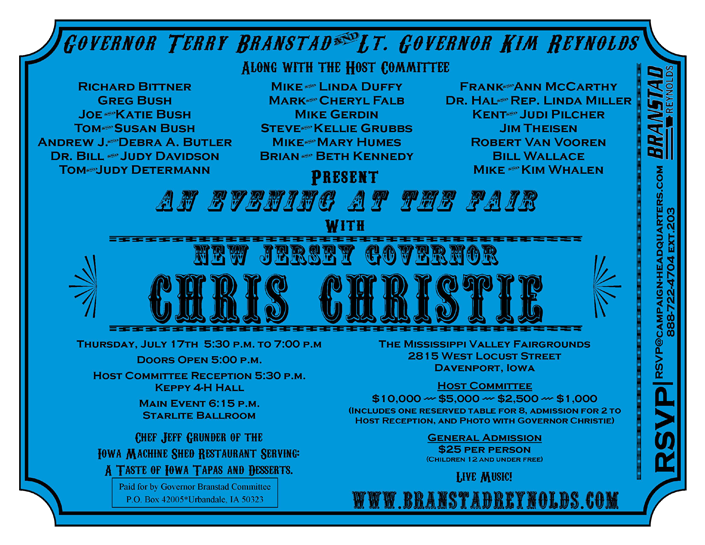 If you donate $10,000 to Christie's dinner, you're on the host committee, you get a table for 8 and you get a picture of yourself with Christie. You can also get the same deal, including the picture with Christie, for $1,000, $2,500 or $5,000. Late last month there were a flurry of reports about a second Bridge scandal. Time endeavored to delineate between the two unrelated bridge scandals for its readers. Christie seems to have gotten his hands on money from bonds sold to repair the Lincoln Tunnel and used it to repair the Pulaski Skyway instead. "The first bridge controversy centers on allegations that Christie allies closed lanes leading to the George Washington Bridge as political retribution against a local mayor who wouldn’t endorse his reelection. The story badly damaged Christie’s reputation as a no-nonsense politician who puts governing ahead of politics. 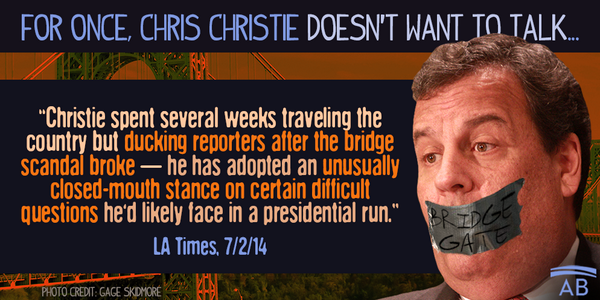 But in some ways, the latest scandal appears to suggest the opposite intent on Christie’s part. The Pulaski Skyway is a dilapidated overpass in desperate need of renovation. Repairing it undoubtedly serves the state’s interests, while closing lanes on a busy bridge that connects New Jersey and New York did not." 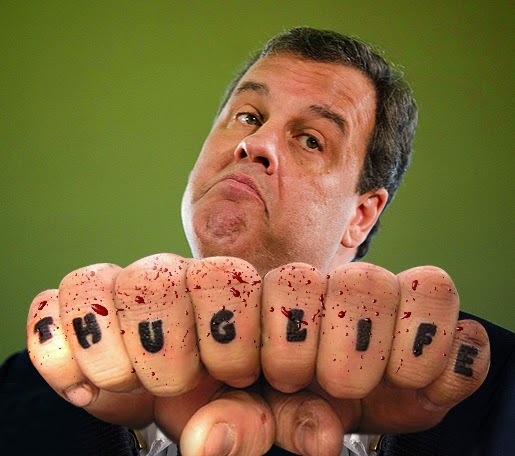 Only 32% of New Jersey residents believe Christie's explanations for the scandals and, even without a smoking gun, 47% of poll respondents are convinced Christie is personally involved in the George Washington Bridge shutdown and the coverup. Going into the 4th of July weekend there were unrelated reports about more Christie political corruption of a more conventional nature-- and probably easier to prosecute. Corporations that contributed millions of dollars to the Chris Christie-led Republican Governors Association and other GOP campaigns have received public funding deals worth almost $1.25 billion from his New Jersey administration in less than two years. A review of the 30 biggest corporate subsidies awarded by the state of New Jersey since Christie appointed one of his closest allies as head of the state’s “bank for business” found that 21 went to ventures involving firms that made significant donations to Republicans, or had senior executives who did. About half made contributions, totalling $1.8 million, to the Republican Governors Association (RGA), the organisation that works to elect GOP candidates to statehouses around the US, since Christie became one of its senior officials. The New Jersey governor now chairs the RGA. Others contributed millions more to Republican committees and candidates including Christie himself; 2012 presidential candidate Mitt Romney, for whom Christie was a campaign surrogate and senior fundraiser; and state senator Joseph Kyrillos, Christie’s former campaign manager. ...“It seems pretty obvious to me that we don’t have enough safeguards in place to make sure these awards are not going out based upon favouritism,” said Senator Loretta Weinberg, the co-chair of the New Jersey legislature’s select committee on investigation. Assemblyman John Wisniewski, her co-chair, said that Christie should be stripped of his power to appoint the EDA’s chief executive. “It seems to be part a pattern within this administration: the gross politicisation of what up until now had really been straight economic development,” said Wisniewski. Republican Party polling firm Rasmussen shows Hillary Clinton handily beating all the GOP potential nominees. Ted Cruz, the likely nominee goes down 50-37% and Christie, who was once closest to tying her in the polls is behind 47-33%, the exact same result as Jeb Bush. Reusing driftglass' image of Christie (http://driftglass.blogspot.com/2014/03/chris-christie-mounts-comedy-is-not.html) with the attribution removed is a very assholish thing to do. The Republicans will twist the damaged gonads of their Blue Dog captives to ensure that Christie never faces any consequence of his vile actions. How about Pensiongate too? Pay to Play violations. Politics And Food Safety-- Is There A Connection?